Happy Cinco de Mayo! Mexican food is one of my favorite cuisines. 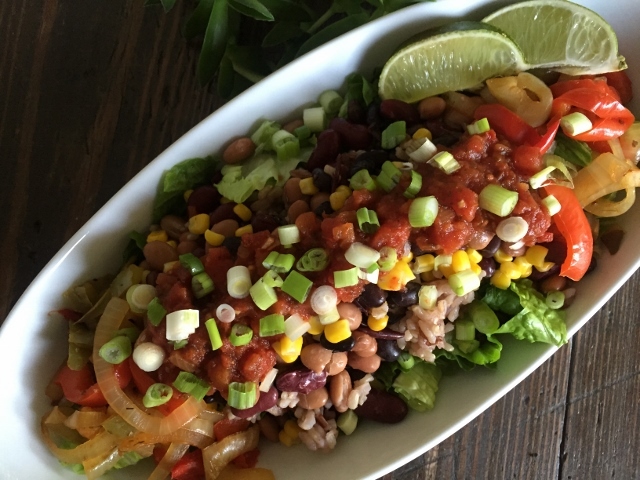 It’s quick,easy,flavorful and healthy. Which means it meets all my requirements to simplify my cooking by spending less time in the kitchen so I have more time for activities. Once our daughter introduced us to the Chipotle Mexican food chain we were hooked. I love their salad and my family loves the burrito bowls. 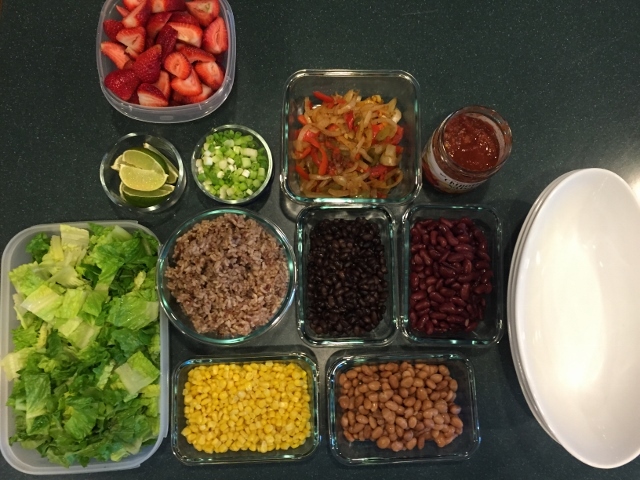 I adopted their concept for a burrito bowl and we make our own healthier version at home. Our son was here for dinner the other night and I needed something quick and easy to make that we would all enjoy. He is not a plant based eater but he is willing to try some of our food and of course like us he adores Mexican food. In 30 minutes I had a nice little feast prepared and everyone was happy. 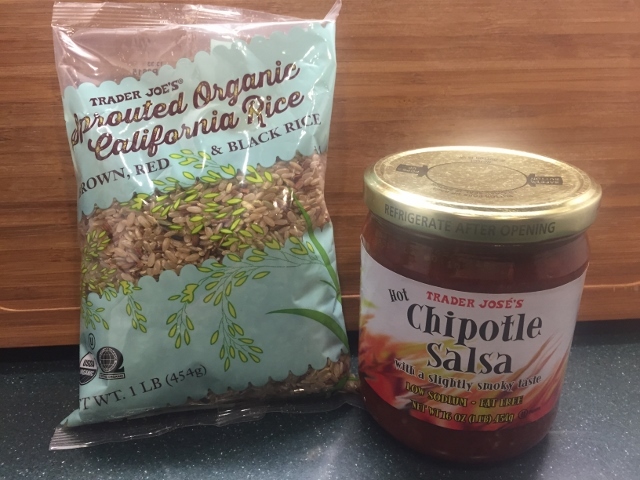 This was the first time for making Trader Joe’s Sprouted Organic California Rice Blend. It cooks up in just 25 minutes on the stove top. My cheater salsa is the Trader Joe’s Hot Chipotle Salsa – it’s not salt free but it is low sodium. However if you prefer to make your own salsa and have them be salt free I have a great recipe Tami’s Easy Salsa. Or this one for a Green Salsa is also a winner. When the rice is done cooking you can add some fresh lime juice and cilantro if desired. Mmmmm – so yummy. Romaine works best for this salad as it can really hold up to all the toppings and not wilt. I had a bag of Whole Foods brand 365 frozen peppers that were tossed into a hot nonstick skillet along with a sliced onion and a little low sodium vegetable broth and cooked until tender. At the end I added a little garlic powder and dried oregano. If you have home cooked beans that’s awesome but this night I did not, so canned beans it was. Rinse and drain them well and heat them up. We had black beans, red kidney beans and pinto beans. Frozen corn warmed up in the microwave adds color, flavor and fiber. Green onion slices and fresh limes are a must. Unfortunately my cilantro had bit the dust and there wasn’t time to run to the store for more so we did without. If you like cilantro it does add a lot of flavor. Meals that are served up like this are perfect for appealing to everyone’s preferences. You get to pick and choose your options and build your bowl the way you like it. The leftovers hold up for a couple of days so we can enjoy this meal again. I love that. 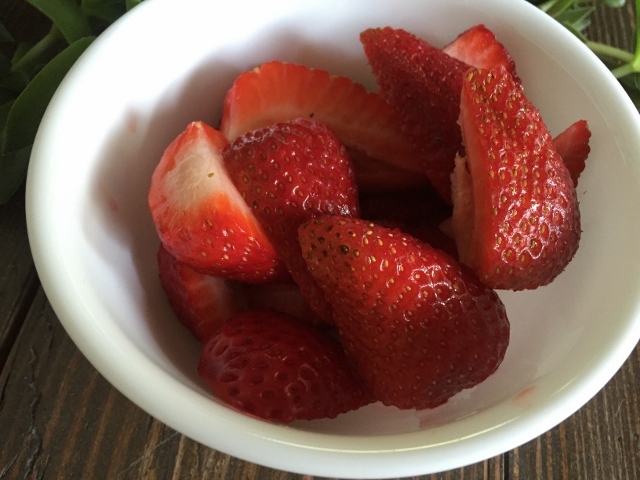 We enjoyed the strawberries as dessert – and I am not kidding when I say they tasted like candy. Our son David asked me why my strawberries taste so much better than the ones he buys. Well I buy organic strawberries at the farmer’s market and the flavor is amazing – you can’t get anything like this in the grocery store! I call them natures candy. If you follow me on facebook or Instagram you know that I am following Chef AJ’s Ultimate Weight Loss Plan. I started around February 15th and so far have lost 18.5 pounds! I couldn’t be happier with this program. 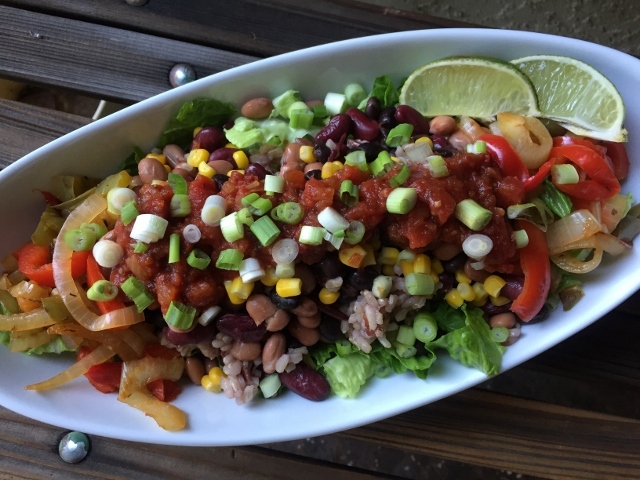 Removing processed foods from my menu and adding whole food starches – yes starches like potatoes, rice, corn and peas to my daily menu has made all the difference in the world. My hunger has dissipated – really it has. Food cravings are a thing of the past. This way of eating is not only good for weight loss but more importantly it is a health promoting diet. It’s good for keeping your heart healthy, controlling blood sugar and for lowering your risks of developing other diseases like certain types of cancers. It reduces inflammation in your body which helps with achy joints. My knees are feeling so much better. Having lost weight makes riding my bike and hiking less tiring. It’s a more simple way of eating which means our meals don’t take hours to make but we actually enjoy the food even more. Why? Well because the food is real and not processed. Our taste buds and our brains have neuroadapted to the natural taste of food. When you get off high amounts of fat, salt and sugar that is ever present in processed foods you can actually taste and enjoy the flavor of food in it’s natural state. Fruits and vegetables seem to be bursting with flavor now that we can fully taste them. Our meals are made from the most nutrient dense but lowest calorie dense foods like fruits, vegetables, complex carbohydrates which includes whole grains like rice, quinoa, and millet and the entire wide array of legumes which includes lentils and beans. The meal options are endless with this huge array of delicious beautiful foods to choose from. Good nutrition leads to good health. Please feel free to leave a comment or ask a question. I love to hear from you! I have never been to Chipotle, from Canada so not as many options, but always wanted to go… and must say these bowls look SOOOOOO good! I’m currently printing out recipes to try on my family when at the cottage for a month and for sure these are in! I missed you blogging and just checked tonight, and low and behold you have new posts!! 🙂 Thank you for your inspiration and delicious recipes! Great to learn such detail about Chipotle Burrito. I love Mexican food including this delicious Burrito. I am amazed that it takes only 30 minutes for you! I didn’t tried at home yet. I thought it will take around 2 hours. I need to give a try to this delicious Mexican recipe. Thanks a lot! Keep it up. I just started eating a plant based diet. Love this recipe! Also, love the oval bowls…… where do you get them? That makes eating the burrito bowl all the more fun! Hi Annnette – I bought these dishes at Costco last year. I haven’t seen them there since. I would check at Bed Bath & Beyond and see if they have something similar.